Ages 5 and up. The Phonological Awareness Training for Reading program was developed to increase the level of phonological awareness in young children. The program is divided into four sets of activities: warm-up, sound blending, sound segmenting, and reading and spelling. The warm-up phase includes rhyming activities to help children focus their attention on the sounds in words. Following the warm-up, children begin the formal training program with activities that teach them to blend individual sounds to make words. They then begin the more difficult segmenting activities. In the final phase of instruction, children are taught how to use their phonological awareness skills in reading and spelling. The program can be taught either individually or in small groups. 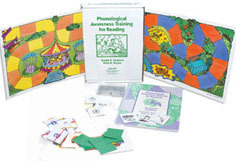 The Phonological Awareness Training for Reading program takes about 12 to 14 weeks to complete if children are taught in short sessions three or four times a week. The program should be used with at-risk children in kindergarten to help prepare them for reading in first grade or with first- or second-grade children who are having difficulties learning to read. TARGET GROUP: Developed primarily for children in kindergarten through grade 2. Can be used with older children who have special learning needs. Short term special offer- SAVE money now!